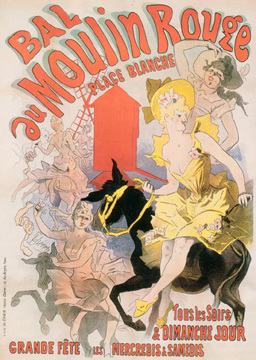 The Moulin Rouge, which created the cancan craze, opened its doors on October 6, 1889. The donkeys are not Chéret's imagination, the two shrewd creator/ promoters, Joseph Oller and Charles Zidler, actually had girls riding donkeys outside to attract attention to the place. That soon became superfluous, as all Paris came to gawk at the display of frilly female under things by high-kickers like La Goulue, La Torpille, Miss Rigolette, Hirondelle and others, ushering in the Naughty Nineties in a swirl of petticoats.